For other uses, see Speedrun (disambiguation). Speedrun of the Ice in the Hole phase of SuperTux, skipping a large portion of the level by abusing a collision glitch. A speedrun is a play-through (or a recording thereof) of a video game performed with the intention of completing it as fast as possible. Speedruns may cover a whole game or a selected part, such as a single level. While all speedruns aim for quick completion, some speedruns are characterized by additional rules that players promise to obey, such as collecting all key items. Players attempt speedruns mainly to challenge themselves, to entertain and compete with others. To achieve a high level of play, speedrunners often have to reason about the game differently from the way that ordinary players might. Speedruns usually follow gameplay routes that are planned out carefully before they are attempted. Many games have opportunities to disarrange the intended sequence of events and skip entire parts of it — often called sequence breaking — and many more have programming mistakes, or glitches, that a skillful player can exploit to their advantage. Tool-assisted speedrunning is a type of speedrunning in which various computer tools are used to obtain performances which would be near-impossible for a human player. Some games are considered to be particularly suited to speedrunning and have online communities dedicated to them, which can provide an active platform for discussing, publishing, and improving speedruns. Speedruns can be viewed on a variety of platforms, including live streams where players can carry out and share their attempts in real-time. Although speedrunning was originally not a widespread phenomenon, it has since grown to involve several active websites and an increasingly expansive assortment of speedrun videos that are freely and widely circulated on the Internet. While routing, it becomes apparent that some of the goals in the game do not need to be achieved for completion. Such elements include cutscenes that need to be watched before the player can progress, items that the player needs to possess in order to continue to a next stage or even entire parts of the gameplay that may convey a part of the game's plot or a subplot. Skipping a part of the game in such a fashion that it can be described as disjointed with the game's intended/common sequence of events is referred to as sequence breaking. The term sequence break was first used in 2003 in an online discussion forum thread concerning the Nintendo GameCube game Metroid Prime. [Note 2] The original thread was called "Gravity Suit and Ice Beam before Thardus"; since then, the "x before y" notation has become common in the nomenclature of speedrunning. Thardus, a fictional creature in the Metroid series, was designed to be a mandatory boss before the Gravity Suit and Ice Beam could be obtained, hence the novelty of bypassing the boss while still obtaining the items. Since its initial discovery, sequence breaking has become an integral part of speedrunning and has been applied to many other games. A specific way to do sequence breaking in a specific game is usually called a skip, and well-known skips are known in their communities under names that easily identify it. Usage of a glitch in Super Mario 64 to pass through a wall, performing a sequence break. An example of sequence breaking as a result of a glitch can be found in the "16 Star" run of Super Mario 64. In this game, Mario normally needs to collect at least 70 of the 120 power stars before he is allowed to challenge Bowser, the final boss, but a glitch makes it possible to access the final level with only 16 stars. With the right kind of movement, it is possible to pass through the boundary of a wall by pushing into it while holding onto MIPS, an NPC rabbit. Since then, similar tricks have been found to complete the game without collecting any stars. While some speedrun rules require that the skipping of such events be avoided, it is often desirable to make full use of such possibilities. Therefore, some websites, such as Speeddemosarchive, offer support for multiple speedrun categories. Each category specifies which glitches are permitted and what game objectives must be completed. For example, it is typically agreed that glitches arising from outside the game, such as improperly inserting the cartridge, are impermissible. Removing or altering a game disc/cartridge/files while the game is running is forbidden. Examples of this are the crooked cartridge trick in The Legend of Zelda: Ocarina of Time and the CD streaming trick in The Legend of Zelda: Twilight Princess. If you're not sure what this rule means, think about it this way: don't mess with your system while playing the game, and don't modify the game itself at any time. Although most speedruns assume normal human play of a game, tool-assisted speedruns (abbreviated TAS) allow authors to use outside tools to aid their playing. For example, utilizing the save state function of an emulator to go back in time and revise mistakes (known as re-recording), or using software to read variables directly from the game's memory, giving the player information not normally available to them. The result is that human limitations, such as skill and reflex, are no longer a barrier in the creation of a run; tool-assisted runs have (sometimes significantly) lower completion times than their unassisted equivalents. Any%, or fastest completion, refers to completing the game as quickly as possible, and often involves sequence breaking. 100%, or full completion, requires the player to complete the game to its fullest. This often includes collecting all key items or upgrades, finding all secret features, or anything else that may be deemed important. Specific requirements for a 100% speedrun are different depending on the game. Some games, such as Super Metroid, have a percentage counter and therefore have an easy definition for 100%. Others do not, and instead the game's community decides what the definition for 100% should be. Any% and 100% are the most common categories for speedrunning. Low%, or minimalist completion, requires the player to complete the game by obtaining the fewest key items or upgrades possible. If the fastest way to complete the game already involves the player picking up the fewest key items or upgrades, a low% category may not exist for that game's speedruns. As with 100% runs, low% speedruns have requirements that vary between games. In addition, there can be game-specific categories that change how much of the game must be completed. These categories usually include completing or avoiding specific aspects of the game and/or not allowing certain glitches or game exploits to be used in the run. An example of this would be the medallions/stones/trials category in The Legend of Zelda: Ocarina of Time; this category requires the runner to beat all major levels in the game and restricts some of the glitches that can be performed. In Donkey Kong Country 3, there is a "Water%" run, which constitutes collecting every DK Coin in the game; this requires the player to collect every Bear Coin to access the Lost World, but does not require a player to actually 100% the game and ignore the Banana Birds. Historically, speedruns have been performed by members of online communities pertaining to video games in general. When the activity became popular enough to accede to subculture, the first sites dedicated to speedrunning started appearing—usually specializing in just one or a few games. Some of these sites have sustained activity for a long time, sometimes even up to today, providing coverage of its members' achievements and serving as a platform for related discussions. December 1993 saw the release of id Software's Doom, which allowed players to record demo files of their playthrough. The feature was first picked up by Christina "Strunoph" Norman in January 1994 when she launched the LMP Hall of Fame website. This site was, however, quickly followed up by the DOOM Honorific Titles (also known as the "DHT"), launched in May 1994 by Frank Stajano, which introduced the first serious competition between players. This site, designed around a notion of earning titles by successfully recording a particular type of demo on one of the predetermined maps in the "IWADs", would create the basis for all Doom demo sites that would follow. These so-called "exams" became very popular as the player had to earn each title by submitting a demo of the feat to one of the site's judges to justify his application. Doom II: Hell on Earth was released in October 1994, and the DHT conformed to the new additions as well as the new Doom version releases. At the height of its popularity, the DHT had many different categories and playing styles. For example, playing with only the in-game fists and pistol, while killing all monsters on a map, became known as "Tyson" mode, named after the heavyweight boxer and former champion Mike Tyson. "Pacifist mode" was playing without intentionally harming any monsters. Each category had "easy", "medium", and "hard" difficulty maps for players to get randomly chosen for. As an authentication method to prevent players from submitting demos made by other people, it was required that they performed a distinct "dance" during their demo (often at the very beginning). With such varied categories, the DHT was appealing to a diverse group of players. However, the DHT had trouble retaining a permanent Internet location. This, combined with the constantly changing rules and the diminished importance of most of the titles, caused public interest to wane as the years went by. In November 1994, the definitive installment Doom speedrunning scene, in the form of the COMPET-N website, was launched. Its creator, Simon Widlake, intended the site to be a record scoreboard for a variety of Doom-related achievements, but unlike its predecessors, they were all based on the idea of fast completion, thus making it the first actual speedrunning site. Players were challenged to run through Doom's levels as fast as humanly possible in order to attain a spot on the constantly updated COMPET-N scoreboards, leading to demo material gradually amounting to hundreds of hours of recorded gameplay. Like the DOOM Honorific Titles, this site experienced multiple location changes over time; it was hosted on the Simtel servers for a while, before Istvan Pataki took over as maintainer and moved the site to a now defunct FTP server of the Technical University of Budapest. From there on, since early 1998, it had been administered by Adam Hegyi, who was maintaining the site, but left around 2007 without notice. In 2012, COMPET-N player Zvonimir 'fx' Bužanić took over maintaining the site and re-created new database for WAD-s and PWAD-s. It is currently located at http://www.doom.com.hr/compet-n.
As of November 2007, COMPET-N contained a total amount of 6072 demos (on both official and custom maps), accounting for a total time of 462 hours, 8 minutes and 20 seconds. As of January 2012, COMPET-N contains a total amount of 9122 demos (on both official and custom maps), accounting for a total time of 749 hours, 41 minutes and 47 seconds. 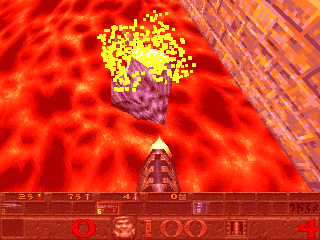 A "grenade jump" is used in the E4M3 (The Elder God Shrine) level in Quake in order to jump over a large lava pit without having to wait for a bridge to appear. Following the success of the Doom speedrunning community, people first started recording demos of Quake playthroughs when it was released in June 1996 and sharing them with others on the demos/e directory in Simtel's Quake file hierarchy. There were two distinct kinds of demos: those in which the player killed all monsters and found all secrets on the map (called "100% demos") and those in which the player ignored these goals in order to finish the level as fast as possible (called "runs"). All levels were, at that time, recorded solely on the "Nightmare" difficulty level, the highest in the game. In April 1997, Nolan "Radix" Pflug first started the Nightmare Speed Demos website to keep track of the fastest demos. In June of that same year, the first Quake done Quick project was finalized; Quake done Quick, unlike the conventional record demos, featured a full playthrough of the game, carrying over one level's finishing statistics to the next. The project members ended up making a movie in which the entire game is finished on Nightmare difficulty in 0:19:49; it was a collection of the best runs that the members of the site had been made thus far, and at that time, there was no other run that came close. The run was "recammed", i.e reconstructed so that it could be also viewed from a third-person perspective, which gained it its machinima status. It received widespread attention from gaming magazines, being distributed as part of the free CDs that they came with. This popularized speedrunning for a much larger audience than before and attracted many newcomers. Not all of those newcomers agreed with the standard that runs should be made on the hardest possible difficulty level. Thus, in August 1997, Muad'Dib's Quake Page came to be, run by Gunnar "Muad'Dib" Andre Mo and specializing in "Easy" difficulty runs. One month after that, the Quake done Quick movie was superseded by a new movie called Quake done Quicker on September 14, 1997, which shortened the game's fastest playthrough to 0:16:35. In April 1998, Pflug and Mo merged their pages, thus creating the Speed Demos Archive, which, as of 2007, is still the dominant community for Quake speedrunning and also acts as repository for demos, maps, statistics, and software pertaining to the practice. Ever since its creation, a large variety of tricks have been discovered in Quake's physics. Despite being released as early as 1996, Quake has steadily remained popular with its players, who subsequently released the Quake done Quick with a Vengeance movie on September 13, 2000, which featured a complete run through Quake in 0:12:23. Primarily tricks that had not been used in both its predecessors allowed for this improvement, as the run's manual states that it "[makes] use of every known trick, including unrestricted bunny-hopping, to represent the state-of-the-art in Nightmare running". As of September 2014, Speed Demos Archive can be found at the web address http://speeddemosarchive.com/ and contains a total amount of 9535 demos (on both official and custom maps), accounting for a total time of over 250 hours. In December 2011, a new run was produced and called Quake done Quickest. The improvements that were made resulted in a time of 0:11:29 for the entire game, an improvement of 54 seconds over Quake done Quick with a Vengeance. Released in August 1986, Metroid was one of the earliest games to introduce special rewards for fast completion times. As is the case for the rest of the games in the series, highly nonlinear gameplay makes it possible for runners to search extensively for different routes towards the end of the game. In particular, the ability to perform sequence breaking has been researched thoroughly, leading to the discovery of ways to complete the games while obtaining only a small percentage of items. Prior to the inception of Metroid speedrunning, there were special websites which documented these so-called "low-percentage" completion possibilities. The first game to be exceedingly popular with the speedrunning audience was Super Metroid, released in 1994, which proved to lend itself to fast completion purposes very well. It featured a physics system that allowed for a wide array of skills for mobility, like "wall jumping" or the "Shinespark", allowing players to skip over large areas of the game, or play through the game in different manners based on how well they can perform these tricks in contextual situations. Additionally, it had the same nonlinear gameplay as its predecessors. Due to the way the game was laid out, several different run types or tiers that incorporate different completion percentages have been performed,[Note 3] including any%, 100%, low%, and reverse boss order (RBO), in which the player beats the game's bosses in the opposite order they were meant to be played via sequence breaking. As the Internet became more available to the general public, groups of players started collaborating on message boards to discuss these tricks with one another in what became a community based on playing the games speedily. The first Metroid community that was created for the purpose of fast completion was Metroid Prime Discoveries, created and led by Jean-Sebastien "Zell" Dubois. Rather than being a site that focused on speedrunning, it was dedicated to documenting the possibilities of sequence breaking in the game Metroid Prime. When the interest arose to begin the documentation of other games in the series, however, the new site Metroid 2002 was created by Nathan "nate" Jahnke in August 2003. Initially, the only incentive was to document the two Metroid games released in 2002—Metroid Prime and Metroid Fusion—but this changed when Nathan was asked to take all content of Metroid Online—another site that had been developed at that time and contained sequence breaking documentation, a message board, and a 1% Metroid Fusion run—and relaunch Metroid 2002 as "the one resource for Metroid Prime sequence breaking info." This relaunch happened less than two weeks after the proposition and came to be in November. Ever since, it has been the central repository for everything related to speedrunning the Metroid series. It was also in November 2003 that Metroid speedrunner Nolan Pflug released his 100% run of Metroid Prime, in which he finished the entire game in 1 hour, 37 minutes. [Note 4] Since it was featured in the games section of Slashdot, it gained widespread attention. Publications in numerous different languages ran stories on the run, and topics about the run were made on gaming message boards around the world. The first segment of his run was being downloaded over five thousand times a day at the peak of its popularity. The Metroid 2002 IRC channel was flooded with people who had heard about the run and wanted to know more about it, fast dwarfing the original population, and its message board saw its member count double in size the month following the run's release. As a result of the popularity of this run, it was decided that in order to best serve the growing bandwidth consumption, Metroid 2002 would have to merge its array of videos with Speed Demos Archive, which was at that time being provided nearly limitless server capacity for their runs on the Internet Archive. As of September 2018, the best completion time for the North American version of Metroid Prime is 51 minutes by "JustinDM." He has also reduced the 100% time to 1 hour 10 minutes, obsoleting "Bartendorsparky"'s and "MPZoid"'s runs. Like other such communities, the maintainers of the site stressed that their demos were for entertainment purposes rather than skill competitions, although the attempt to have the fastest time possible with tools itself became a competition as well. The site became a success, usually updating several times a week with demos recorded by its maintainers and submitted by its readers. The site was active until August 10, 2001, at which point a news message was posted to state that the site would cease its regular updates and act as archive from then on. The popularity of Doom tool-assisted speedrunning has dwindled since then. In mid-2003, an anonymous speedrunner using the nickname Morimoto (もりもと) released a video in which he played through Super Mario Bros. 3 with an unprecedented level of skill; he beat the entire game in just over 11 minutes without making a single mistake and managed to accumulate 99 1-ups throughout levels during which he had to wait. In addition, he put himself in dangerous situations over and over, only to escape them without sustaining any damage. Although it was widely believed that the video was made by an extremely skilled player, it was actually the first tool-assisted speedrun made with a special emulator to generate widespread interest. [Note 6] When Morimoto detailed the making of the run on his website, many felt deceived and turned to criticizing the video's "illegitimacy" instead. The knowledge that the video was constructed through tedious and careful selective replaying also raised some questions about the authenticity of video game replays; after all, if it is practically impossible to tell the videos of both kinds apart, one cannot possibly know whether a run was made with or without the use of a special emulator. It was even feared that this fact would cause the downfall of competitive speedrunning. Neither the Speed Demos Archive nor Metroid 2002 have ever published runs that were known to be made with a special emulator. Nolan Pflug, the former webmaster of Speed Demos Archive, has been quoted as saying, "My basic thought is 'don't like them, haven't made them, don't watch them,'" when asked for his opinion on the subject. Thus, in late 2003, the first public website that served tool-assisted speedrun videos from multiple authors, TASVideos (then known as NESVideos), was created. It was originally created by Joel "Bisqwit" Yliluoma for the purpose of showcasing, sharing, and discussing speedruns made with special emulators—at first, the site only held videos of Nintendo Entertainment System games, in part due to the fact that the only emulator suitable for this specialist purpose was, at that time, the Famtasia NES emulator. Besides just serving the speedrun recordings in the emulator's original format (which, much like Doom and Quake demos, required both the emulator and the game in order to be played back), the site also held AVI files, which were made available using the BitTorrent protocol. As of March 2016, it holds over 3,000 complete speedruns. In 2014, a new dedicated website was opened up for speedrunners called speedrun.com. Since the website opened, more people from the speedrunning community added game pages to popular video games and has a dedicated leaderboard for each game. The leaderboards show who has what position and who holds the World Record for the game and category. The website also shows who is streaming on what game and has a dedicated forum and a guides section for each game. As of March 2019, the site has over 198,000 registered users and over 790,000 submitted runs. The founder of this website is an Irishman named Peter Chase who online, goes by the name "Pac". This section is about speedrunning marathons in general. For information about the American Speedrunning Marathon hosted by Speed Demos Archive, see Games Done Quick. A speedrun marathon is a web-stream of multiple games being speedrun in succession. This often takes the form of a fan convention where runners get together to speedrun video games to raise money for charity, but may also be a purely online event. The most popular speedrun marathons are the biannual Games Done Quick marathon in the United States. Before the marathons, discussions take place on a forum, and runners submit their game choices. An online schedule is created that will show who is speedrunning, when they are speedrunning, and what game they are speedrunning. Their runs are streamed live at Twitch.tv, and runners often provide commentary throughout the run to give viewers a better understanding of what is going on. Runners who are speedrunning often practice their game in a practice room at the event before their scheduled run as a warm up, or they practice at home beforehand. Speedrun marathons such as the Awesome Games Done Quick 2017 marathon have raised $2,222,934.52 for the Prevent Cancer Foundation. ^ Although many speedruns are released as video recordings, which are often preferred due to being more universal, some communities use a game's native demo recordings (such as the DEM format in by Quake) since these are much more compact and easier to share with others. Such recordings require specific software to view, usually a version of the original game. Some communities release speedruns in both formats so that they become accessible to a larger audience. ^ Metroid 2002, a major Metroid speedrunning website, has retained back-ups of these topics that can be found at http://www.metroid2002.com/home.php. See section "Metroid 2002 (Metroid series)" for more information on Metroid 2002. ^ A "tier", in this context, is a certain time-related goal that determines the strategy or route used in a speedrun. For example, a low-percentage speedrun is in a different tier than an any-percentage speedrun, as both have different completion goals. ^ This speedrun has since been replaced with an improved version, and as such, its original host, Speed Demos Archive, no longer makes mention of it. The original announcement, however, may still be found using the Internet Archive's Wayback Machine at https://web.archive.org/web/20031202174746/http://planetquake.com/sda/mp/. ^ Doom tool-assisted speedrunning is sometimes referred to as "tools-assisted speedrunning", after the first site used to share these demos. A news post after the creation of this site, however, read "Indeed, I was wrong and the site should be called 'Tool-Assisted Speedruns' rather than 'Tools-Assisted Speedruns'. I'm not going to redo the logo though." ^ There is evidence that several tool-assisted speedrun videos had been made before then, including a few others by Morimoto himself, but the Super Mario Bros. 3 video was the first to become popular with a general audience. ^ a b c d e Turner, B. (2005). "Smashing the Clock". 1UP.com. Retrieved August 13, 2005. ^ a b Totilo, Stephen (2006). "Gamers Divided Over Freakish Feats Achieved With Tool-Assisted Speed Runs". MTV News. Retrieved April 11, 2007. ^ "Super Mario 64". Speed Demos Archive. 2005. Retrieved March 25, 2006. ^ Frank, Allegra (July 9, 2018). "One of Super Mario 64's toughest speedrun records has been broken". Polygon. Retrieved February 19, 2019. ^ a b "Speed Demos Archive - Rules". Archived from the original on October 22, 2015. Retrieved March 22, 2016. ^ "ZeldaSpeedRuns Leaderboard Rules". ZeldaSpeedRuns. Archived from the original on September 16, 2016. Retrieved September 1, 2016. ^ TASVideos contributors (2006). "Why And How". TASVideos. Retrieved March 27, 2006. ^ Good, Owen S. (June 23, 2018). "Summer Games Done Quick 2018: everything you need to know about the first day". Polygon. Retrieved February 19, 2019. ^ a b "low%/100% definitions". Retrieved March 22, 2016. ^ "sweetnumb's SM 100% Item Advanced Tutorial with WildAnaconda69". Twitch. ^ "SpeedRunsLive Speedrunning Glossary". SpeedRunsLive. Archived from the original on June 15, 2018. ^ Steele, Brian (November 15, 2015). "Speedrunning — A Primer For Beginners, By a Beginner". Medium. Retrieved July 5, 2018. ^ "water% definition". Retrieved June 19, 2016. ^ a b c d e f Merrill, D. (2003). "A Brief DOOM Demo History". Doomworld. Retrieved October 16, 2005. ^ "Doom Honorific Titles". Doom Honorific Titles. Retrieved October 28, 2016. ^ a b "COMPET-N Database". Doom2.net. 2006. Archived from the original on April 12, 2014. Retrieved October 28, 2016. ^ Petersen, Sandy. "e4m3 – The Elder God Shrine". Speed Demos Archive. Retrieved January 6, 2011. ^ a b c d e f Speed Demos Archive contributors. "History of Quake speed-running". Internet Archive. Retrieved November 29, 2007. ^ "Quake done Quick". Retrieved March 22, 2016. ^ "PlanetQuake". gamespy.com. Archived from the original on April 9, 2006. Retrieved March 30, 2008. ^ Machinima.com Staff (2001). "Showcase: Quake done Quicker". Machinima.com. Archived from the original on April 9, 2008. Retrieved October 28, 2016. ^ a b Speed Demos Archive contributors (2000). "Quake Done Quick: QdQr". Speed Demos Archive. Retrieved March 30, 2008. ^ "Quake done Quick with a Vengeance". Archived from the original on April 23, 2006. Retrieved March 25, 2006. ^ "Quake (PC) – Speed demo collection". Internet Archive. 2007. Retrieved September 10, 2014. ^ Speed Demos Archive contributors (2011). "Quake done Quickest". Speed Demos Archive. Retrieved April 12, 2012. ^ "Lycos.com". Archived from the original on April 10, 2008. Retrieved March 22, 2016. ^ Jahnke, N. (2005). "history of metroid 2002, part 1 (was: happy birthday, m2k2!)". metroid 2002. Retrieved April 20, 2009. ^ "Metroid Prime Done Even Quicker". Slashdot. Retrieved January 7, 2011. ^ a b Jahnke, Nate (2005). "history of metroid 2002, part 2". Metroid 2002. Retrieved December 31, 2005. ^ Koskimaa, E.; Sjoblom, P.; Donner, Y. (2000). "Information about Tools-Assisted Speedruns". Internet Archive. Archived from the original on April 11, 2000. Retrieved April 8, 2006. ^ Koskimaa, E.; Sjoblom, P.; Donner, Y. (2001). "Tools-Assisted Speedruns". Internet Archive. Archived from the original on August 13, 2001. Retrieved April 8, 2006. ^ "もりもと" (2003). "emu". Internet Archive. Archived from the original on December 3, 2003. Retrieved December 3, 2003. ^ "NESVideos - Backup". Nintendo Entertainment System "superplay" videos. ^ "List All Movies". tasvideos.org. Retrieved March 25, 2016. ^ "About - speedrun.com". www.speedrun.com. Retrieved February 19, 2019. ^ "The life of an elite 'Super Mario 64' speedrunner". Engadget. Retrieved February 19, 2019. ^ "Donation Index". Games Done Quick 2017. Retrieved January 22, 2017. Snyder, David (2017). Speedrunning: Interviews with the Quickest Gamers. McFarland Publishing. ISBN 978-1-4766-7080-5. This page was last edited on 17 April 2019, at 10:08 (UTC).